Hollywood Heritage Inc. Presents Evening @ The Barn – Gene Autry Rides Again! Gene had 1,000 square feet of closet space in his North Hollywood home. 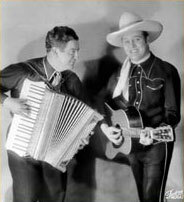 When the subject of doing a new Gene Autry biography first came up we knew there were certain factors that were vital. Chief amongst them was to tell the story now, while it was fresh in the minds and hearts of the people who were closest to Gene. We didn't want a biography written years from now, based on someone's conjecture or personal spin. 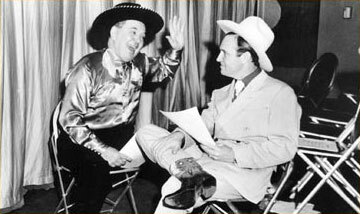 The story also had to be an honest and accurate account of the life of Gene Autry, not a sugar-coated gloss of assorted half-truths, quasi "facts" and sketchy or missing information. We wanted a writer whose background and sensitivity would allow for an in-depth understanding and treatment of the subject. We desired a writer who would sweep aside bias, be willing to review the facts for accuracy rather than personal or literary convenience and, at the same time, stand their ground on presenting a true picture. 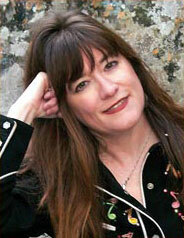 Holly George-Warren in our estimation fit the bill. Her well received New York Times article provided Gene's last official interview. The Cowboy and the reporter developed an instant rapport. Holly understood and loved the country and western genre in all its varied facets, was an accomplished writer and editor, and most significantly her knowledge provided an exceptional grounding from which to weave the threads that would form the fabric of the book. The current economics of the publishing world provided Holly with 100,000 words, a far cry from the original two volumes she wanted. Feisty and determined Holly bartered for more. Understanding the property they had, the book's publisher Oxford University Press upped it to 150,000 words. Even so, Holly realized early on, telling the full story from beginning to end would require much more. She was left with two choices. Sift through all the information, leaving some areas out in order to tell Gene's story from 1907-1998 or give a highly detailed account for a set significant period of Gene's life. Even as the first possibility was mulled over, Holly knew the right course of action and the only course was to tell as much of the detailed story as she could and save the rest for another time. Thus Public Cowboy No. 1: The Life and Times of Gene Autry in the main takes the reader from Gene's roots through the early 1960's with a taste of the years that followed. Holly was given unprecedented access to all of Gene's personal documents and records, many of which had been under lock and key for years. Hundreds of hours of interview were logged with Jackie Autry, family members, close friends, Gene's personal staff, business associates and the loyal fans who would always play a significant role throughout the Cowboy's life. Through several years of research, Holly traveled the roads of small towns and big cities in Gene's footsteps. 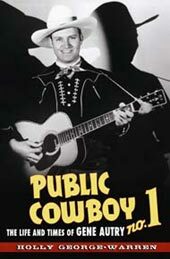 Public Cowboy No. 1: The Life and Times of Gene Autry sets down the story of a remarkable yet complex man whose lifetime spanned a century more heady, turbulent, and exciting than any century before it. Like each of us, Gene was not a one-dimensional figure. 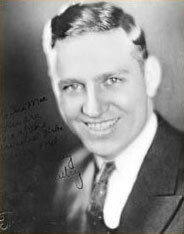 Industrious, hard-working, generous, compassionate, charming, funny, mischievous and talented are all adjectives one can employ to describe Orvon Gene Autry. But the individual who so gently sought out the lonely or awkward child to bring him or her some comfort and cheer, in the same breath fought his own personal demons. There was a young boy who dreamed big and made those dreams come true against incredible odds. And there was a man who strove with all he had to give to constantly be the perfect cowboy hero in the white hat in the teeth of a harsh world not designed for heroes. At a time when many of us are reeling from a society that seems all but stripped of decency and social veneer it might be somewhat disconcerting to learn that Gene was not perfect. And perhaps it gives one cause to sneer at the idea of the Silver Screen Hero as a concept. 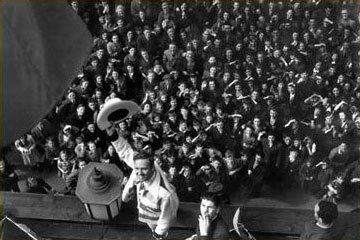 Except for this one thing – through his music, movies and personal appearances, Gene Autry created a persona that brought millions of people hope, courage in the face of adversity, and sterling ideals. Given the fact that a man can envision and create such a character imparts the greatest of possibilities inherent in each of us. Perhaps this gift was Gene's greatest legacy. Maxine Hansen has worked in Gene Autry's personal office since 1981 and is currently the Executive Assistant to Mrs. Gene Autry. She was Gene Autry's assistant for the last 13 years of his life.